George Graham Reviews Jason Becker's "Perspective"
While there are literally thousands of new albums being released every month, every one has a story behind it. Few, though, are as compelling as the one behind the subject of this week's review. It's a recording that not only contains fascinating music -- some first-rate symphonic art rock -- which is interesting and rare enough in itself, but its artist, Jason Becker, has a truly remarkable story. The CD is called Perspective, and it is only now being released after having been made in 1995. Jason Becker grew up in the San Francisco area to artistic parents who supported and encouraged young Jason to take up the guitar. By his late teens, he was already attracting attention as one of the next great guitar flashes. As a co-founder of a group called Cacophony, Becker brought virtuosic speed and technique to heavy-metal-style electric guitar, but like some others in the genre, raised it to a symphonic level with classical and baroque influence. Cacophony made two albums before Becker was recruited for the band of David Lee Roth, the flamboyant former Van Halen lead singer who had departed from the group. Becker got the job with Roth at 19, and though it put him back into simpler, straight rock and roll, Becker couldn't have been happier. He was proclaimed as one of the next guitar heroes in guitar magazines, made an instructional video, and was touring extensively. But around this time in 1989, he experienced a cramp in his leg that left it permanently weak. When the condition did not improve, he sought help and was eventually diagnosed with ALS or Lou Gehrig's disease, a nerve-wasting condition that leads to progressive paralysis, and in many cases, death in three to five years. Becker continued to work in Roth's band, but his condition worsened, and by the early 1990s, the weakness spread to his arms and hands and took its toll on his guitar work. By the mid 1990s, the disease had left him unable to play, speak or with much of any movement. But the disease, as exemplified by the brilliant physicist Dr. Stephen Hawking, leaves one's mental faculties unimpaired. During his period of ascendancy, Becker had become friends with quite a few rock luminaries, including Steve Perry of Journey, guitar ace Steve Hunter, drummer Greg Bissonette, and many others. As Becker's disease took its toll, one of his musical friends, Mike Bemensderfer introduced him to computer music, allowing Becker to compose and also to play some parts with his increasingly limited movement. The result is this album, which is actually his fifth release. It was done in 1994 and 1995 when he was about 25, though parts of it date back to 1991, and the CD contains snippets of guitar parts Becker played on home and studio recordings prior to his disability. Perspective was released previously in Japan, but now six years after its making, due to the efforts of Eddie Van Halen, the CD is out on Warner Brothers Records, a most surprising development considering the almost complete absence these days of anything out of the commercial mainstream on the multi-media-conglomerate controlled major labels. A portion of the proceeds are to go to ALS research. 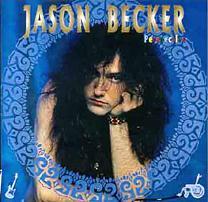 Jason Becker's story would be compelling enough, but his CD is fascinating and engaging, irrespective of that. It's one of the best symphonic rock projects to come along in quite a while, and it features some really interesting arrangements and musical ideas, in some ways brought about by the artist having to serve as exclusively as composer, employing others to play his mostly instrumental music. It's also a very eclectic mix ranging from baroque to cinematic to metal to blues to one all-choral piece. While some of it can tread along the edge of being pretentious, as art rock has been wont in the past, most of it makes for absorbing, often exhilarating listening. Among those appearing on the CD are drummer Greg Bissonnette, bassist Matt Bissonnette, keyboard man Danny Alvarez, who is the most prominently featured musician on the album, plus Journey's Steve Perry, guitarist Steve Hunter, Mike Bemensderfer, who plays woodwinds, and Becker's brother Ehren who plays bass, and his father Ron Becker, who is heard on acoustic guitar. One can't help but feel the poignant quality of Jason Becker's CD Perspective. A young guitar virtuoso, with striking rock star good looks, is gradually robbed of his abilities by a devastating, debilitating, incurable disease, now reduced to almost complete disability, even depending on a tube in his throat to breathe. He's about 32 now, and says that after trying many treatments and experiments, his disease is not getting any worse, and he feels he might possibly be improving some. He has beat the time the doctors gave him to live, he remains positive in his attitude, and still enjoys the friendship and support of his friends in the rock world, who helped to arrange for the release of this unique album. In a way, Perspective would not have happened if Becker had not lost his ability to play his guitar. It forced him to re-think the creative process, and the result is some fascinating and often uplifting music, in the league with some of the best that the art rock world has provided. Making it even more enjoyable is its sonic quality, to which we'll give an unqualified grade "A." The recording nicely integrates the diverse elements, from the choral performance to the well-restored home recordings of Becker. There's also a gloriously wide dynamic range so the full impact of the music can be heard, especially as it moves from the quieter passages to the full crescendo. That is also something that is very rare these days on a rock album, especially one on a major label. Jason Becker's Perspective is surely one of the most remarkable and memorable albums so far this year.